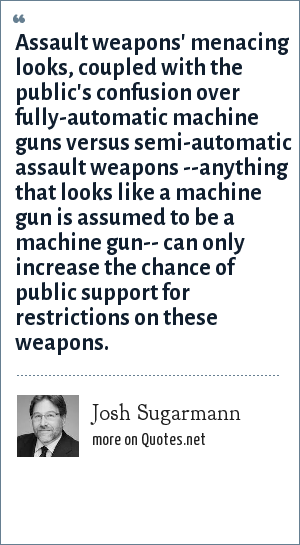 Josh Sugarmann: Assault weapons' menacing looks, coupled with the public's confusion over fully-automatic machine guns versus semi-automatic assault weapons --anything that looks like a machine gun is assumed to be a machine gun-- can only increase the chance of public support for restrictions on these weapons. "Josh Sugarmann Quotes." Quotes.net. STANDS4 LLC, 2019. Web. 18 Apr. 2019. <https://www.quotes.net/quote/17826>.